Seldom has Puccini’s beloved opera sounded so sweet and utterly innocent as it does in this emotionally devastating performance. Conductor Thomas Schippers was very young when he led this broadcast, but he understood the nuances of Puccini’s style and how to encourage his singers to blossom into their characters. Licia Albanese and Carlo Bergonzi simply are Mimì and Rodolfo, and their love—and loss—are the stuff of operatic legend. 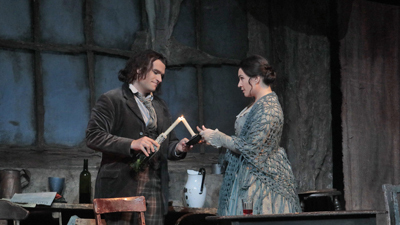 With Laurel Hurley as Musetta and Mario Sereni as her on-again, off-again love, Marcello.